Koni FSD Gold shocks and struts bring the handling and ride of an electronic or electromagnetic shock to a less expensive traditional oil and gas construction. The Koni FSD was first developed for the Lamborghini Gallardo and is now used on high end automobiles from the Fiat 500 Abarth to class A motorhomes. Koni FSD Golds use patented Frequency Selective Valving technology to bring uncompromised handling and ride quality to select high end automobiles. With the FSD Gold shocks, Koni has eliminated the need to choose a trade-off between comfort and performance. Any driver who's had an aggressive suspension setup can tell you how frustrating their performance car was to drive on rough roads. The "communication" and "road feel" that are so prized on the track quickly become a pain in the back (literally) on even mildly rough roads. The Koni FSD Gold provides the comfort of a soft shock with the performance of a very stiff one when needed. 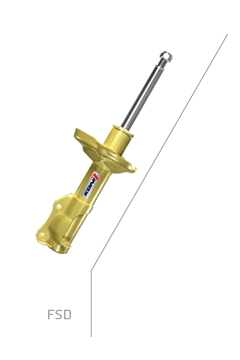 The Koni FSD shock or strut uses a Frequency Selective Damper that automatically changes the shock's damping characteristics depending on the frequency or speed of an impact. That means that during short, hard bumps like driving over road reflectors or hitting potholes, the FSD provides a soft damping profile for comfortable ride. During softer damping event such as cornering (even extremely fast cornering doesn't cause as much immediate movement in a wheel as a hard bump), the FSD chooses a stronger damping profile for better road handling and more cornering speed. The end result is a comfortable road ride for 90% of your trips with strong, direct handling and braking during aggressive cornering or emergency situations. The Koni Gold is about giving a driver the option to use his car as a track racer, a daily driver, a weekend corner carver or a boulevard cruiser. All without needing to get his hands dirty with manual adjustments. Because the Koni FSD's damping profile is selected in part based on the shock or strut's position, the Koni Gold cannot be used with lowering springs. For lowered cars, we recommend the manually adjustable Koni Sport Yellow or the Koni STR.T Orange.